How can progressive parties work better together? How can we change the voting system to make it more proportional? And where can we find a good pastry on a grey Monday morning at Labour Party Conference? On Monday 25th September, we found answers to all the above. 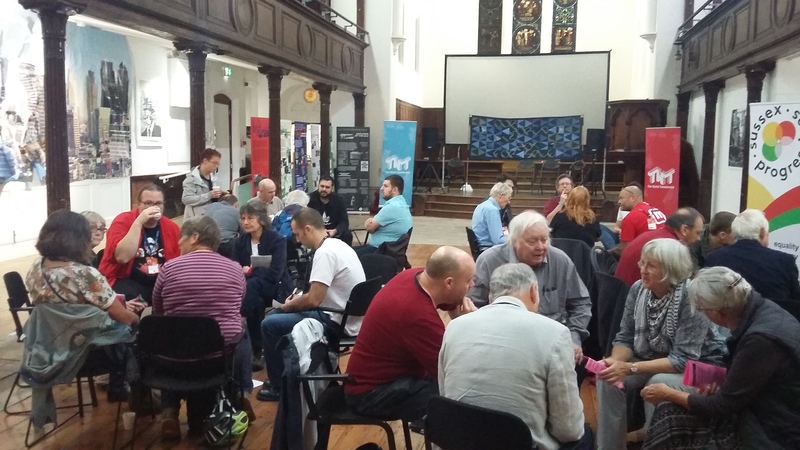 Co-hosted by Make Votes Matter and Sussex Progressives, Compass ran a small event with tea, coffee and pastries to seduce participants to give their thoughts about the Progressive Alliance and Proportional Representation. Attendees were presented with cards to gather initial thoughts, concerns and ideas on PA and PR, then they gathered around questions printed on the floor in groups of 5 or 6 people, discussing their initial thoughts on the subject matter. They were given 8 minutes on each question, the groups would then disperse and gather around another question and repeat. With regards to why the Progressive Alliance has been difficult for Labour, and what are the suggestions to mitigate that, one of the underlying opinions was that people are under the impression that Labour has a “macho” attitude, and is “fundamentally Conservative”, i.e. threatened by new ideas. Essentially, broken down, that Labour must adopt a progressive attitude, and become more democratised in itself as a party if the Progressive Alliance is to work. Along with this, being supportive of fellow candidates in marginal constituencies, as Labour represents the Labour Movement, and others by name do not. One of the fundamental reasons why it is believed progressives should cooperate is to avoid splitting the vote which lands the Tories with a minority rule; it’s a “better way of keeping the Tories out”. Together they are stronger, and better to project shared aims as one. Cooperation would produce nothing but positive results, on a local level, to inflict better policy decisions from all angles. What comes first, Progressive Alliance, or Proportional Representation? It was seen that in order to achieve Proportional Representation, a Progressive Alliance was needed first. It’s a potential knock on effect, PA could be made a reality NOW, versus PR which is a slower process which needs a majority behind it, i.e. with the PA backing it. The informal breakfast meeting was important to gather a variety of differing opinions and thoughts regarding PA and PR from attendees of the Conference outside our organisations, to offer a unique and fresh perspective. It was a positive discussion where all opinions were gathered and noted, one of the most compelling being “Just do it! Take the risk and build the trust.” Hopefully these ideas can be drawn from when establishing the future for the Progressive Alliance, and then sometime soon Proportional Representation. I disagree with clause 3 above. In fact Labour has to have proportional representation in their manifesto first before there is agreement on the Progressive Alliance project going any further. Getting the Tories out is just not enough for the small parties to continue co-operation. I believe some CLPs are trying to put voting reform on next year’s Labour conference agenda. Hopefully that might mean it appearing in their manifesto, but Labour’s constitution always seems to be all smoke and mirrors to me as an outsider. Some obscure committee may well stop it at some stage, even if conference goes for it. The fact is that the Greens won’t be proceeding with the alliance unless Labour’s manifesto includes PR and the Lib Dems are even harder to convince, many of their members second choice is the Tories. Manifesto PR commitment first, then a Progressive Alliance, then, hopefully, a progressive majority in parliament, then agreement that before a Labour led government is actually formed, the first priority for legislation is to implement PR for future elections. The Progressive Alliance project will lie dormant until this is understood.